Derived from the renowned multi-volume International Encyclopaedia of Laws, this practical analysis of the law of contracts in South Africa covers every aspect of the subject – definition and classification of contracts, contractual liability, relation to the law of property, good faith, burden of proof, defects, penalty clauses, arbitration clauses, remedies in case of non-performance, damages, power of attorney, and much more. Lawyers who handle transnational contracts will appreciate the explanation of fundamental differences in terminology, application, and procedure from one legal system to another, as well as the international aspects of contract law. Throughout the book, the treatment emphasizes drafting considerations. An introduction in which contracts are defined and contrasted to torts, quasi-contracts, and property is followed by a discussion of the concepts of ‘consideration’ or ‘cause’ and other underlying principles of the formation of contract. Subsequent chapters cover the doctrines of ‘relative effect’, termination of contract, and remedies for non-performance. The second part of the book, recognizing the need to categorize an agreement as a specific contract in order to determine the rules which apply to it, describes the nature of agency, sale, lease, building contracts, and other types of contract. Facts are presented in such a way that readers who are unfamiliar with specific terms and concepts in varying contexts will fully grasp their meaning and significance. Its succinct yet scholarly nature, as well as the practical quality of the information it provides, make this book a valuable time-saving tool for business and legal professionals alike. 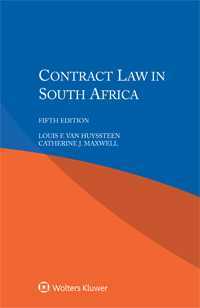 Lawyers representing parties with interests in South Africa will welcome this very useful guide, and academics and researchers will appreciate its value in the study of comparative contract law.